Our Garden Machine Plant is a professional enterprise in the garden field with great popularity, high reputation, good quality and quickly renewed products. We mainly manufacture garden machines such as lawn mowers, lawn aerators, lawn rakes, lawn rollers and chippers / shredders. Among them, the lawn mower has already become the serious product, and well accepted domestically with high performance. Independently developing all products, we are equipped with fully integrated production lines for chassis drawing, pressing, welding, painting and assembly. 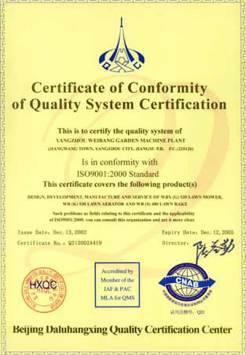 With all procedures strictly conducted according to ISO9001 stipulations, we have passed stringent quality evaluation required by our OEM clients throughout the international market.